Some good friends of my sister and her husband are expecting a baby girl at the end of September and what could be more perfect for a new baby than a new baby quilt? Ahem, I know, I know - I may be a bit biased there but still, it makes a great gift! 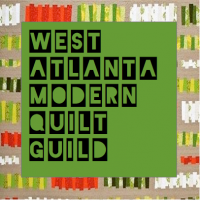 I used 9" blocks from the measurements in Judy Hopkin's 501 Rotary-Cut Quilt Blocks. I love this book because it shows you each block in color (solids not fabrics) AND it gives you measurements to make 6 different sizes of each block. Not all blocks have the same 6 finished measurements which actually gives you even more variety if you're planning a quilt. I used the Mod Doily Fat Quarter Bundle from Fabricworm - it came with 12 different FQ's so I just used once each for an inner and outer block and it worked out perfectly. The finished size ended up being about 27x36 - a good size for a newborn or tummy time but not big enough for a crib quilt. Up this week: maybe another attempt to make my daughter some clothing that she'll wear, I have a couple bag patterns I'm itching to try out with my Purl fabric AND I need to get my For the Love of Solids Swap items done. Plenty of fun stuff to keep me busy! The kid, not the dress that is. The dress is adorable! It's a Babes of Sweet pattern that you can buy as a pdf. I stayed up a little late last night to get this done but I can honestly say start to finish (and that means starting with ironing a piece of fabric) it took a little less than 2 hours and I'm sure the next one will go faster. It also probably took a bit longer because I finished the hem and sleeves with the ribbon method Liesl Gibson uses in her Lazy Days skirt. I like that it encloses the raw fabric edge and to me it seems more even than ironing and turning, which I never seem to do evenly. And when I decided, half way through sewing, that I needed some ribbon I felt like it was a minor miracle that I could find some in the closet that was the exact color and width I needed - blue isn't a color I normally sew with a lot. I had this thought that maybe, maybe if I made something with the doodlebug's favorite color "boo" that she would wear it. Wrong, wrong, wrong silly mama. She did try it on briefly before starting her normal refrain of "no, no, NO". *sigh* Why is she killing my dream of dressing her in cute mama-made attire?! I expected it around age 11 - not 2! And I'm starting to get a little nervous about just how opinionated this kid is. whew. I'm tired. Now I just have to go lock up the house after the cleaners leave and take those last few boxes to the storage space. Then on Saturday cut a very few bushes back and empty the cabinet of deck stuff (bug spray, candles, etc) and we're really, truly DONE and ready for renters! I'll warn you right now that there are going to be a LOT of pictures in this post but hopefully they'll help you if you decide to make the Pintuck Clutch from 1,2,3 Sew or use these type pleats on any other project. This will work the same way for any size rectangle or square that you're using. First you mark your lines on the front of your fabric, so you know where to fold. I used a fabric marking pen and just marked the edges of my fabric because I was worried that ironing the lines would set them. So mark your lines and then fold along the first line - this photo shows the back. Now flip your fabric over and sew along the edge of the fabric - I just used my presser foot as a guide. Look, your first little pleat! You're on your way! Now you flip your fabric back over, so that you can line up your second pleat according to the marks you made, and you iron it down on the BACK. The first pleat will get ironed again as well. Now flip your fabric back over to the front side and sew along the folded and ironed edge, all the way across. Your first pleat will still be on the back (or underneath) of the fabric. Two pleats done - whoo-hoo! Fold both pleats to the back and line up your next pleat, then iron. This will be the pattern for all the remaining pleats, finished pleats ironed to the back along with the new pleat being ironed. Then sew along the front of the pleat you just lined up and ironed. Iron to the back, sew along the front, easy-peasy right? I mean, it only took me like 829 photos to demonstrate! Teehee... But seriously, I hope this helps make the pleats go a little easier for you than they did for the me the first time I tried them! The next round of the 3x6 sampler bee is kicking off and I'm excited for another round of sewing and swapping! To be honest, I'm also happy to be daydreaming about Fall weather as I sit here hiding from the sweltering heat of August in my A/C. *sigh* Enough already summer - come on cooler weather! I'm sure it'll get here around October. 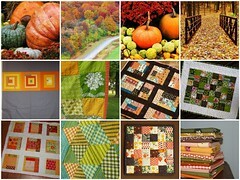 Until then I guess I'll just have to be happy with sewing in those gorgeous fall colors and dreaming. We now return to our regularly scheduled programming! We had a wonderful break last week in our dear little hamlet and it was lovely! Harper enjoyed time with her Great Gram (Na-NAH) and Aunt Cindy and Bob-ah - she was delighted to be the center of such a wide universe. She was also thrilled to continuously give the puppies "one more" treat until their little tummies were probably ready to burst! Now we're back to the real world and I'll be back with some fun sewing stuff this week!